We Have Enough Rain Got. 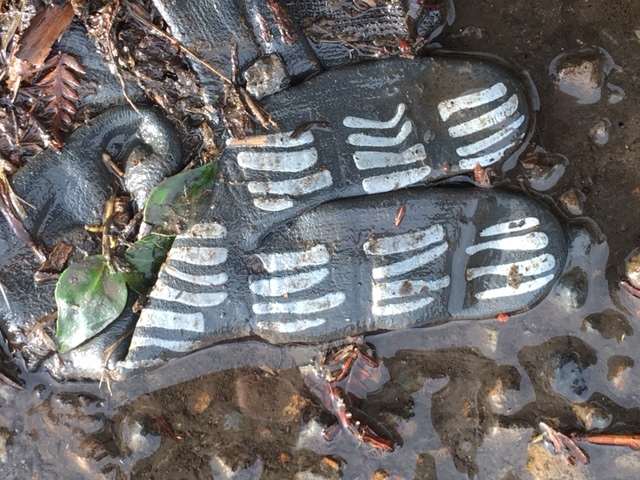 A glove in the mud. A glove in the mud is a welcome distraction from just mud. I am obsessed by the marks on the glove. They look like they have been painted by hand with paint and a paintbrush. They look far more expressive than the usual marks on work gloves. They appear to be more than just grips to ensure that tools and blocks and bricks do not slip while work is being done. And again, the seemingly hand-painted glove is a good distraction from the endless mud. Margaret had been at Ardkeen in Waterford since the 17th of December, but the doctors said they could not operate on her leg until after Christmas. And then they wanted to do the surgery in Cork and not in Waterford. Tommie has been distraught. He had hoped she would be taken care of immediately in Waterford and then sent up to Clogheen for recovery. He was hoping she was going to be brought nearer to home, not further away. By the time she went to Cork and had her operation and skin grafts, several more weeks passed. Tommie has been impatient for her to be closer to home so that he can go to visit her without asking someone to drive him. He spoke of going to Cork on the bus with his Senior Bus Pass but really, he was a bit nervous about doing that. Today Margaret has finally been moved to St Theresa’s in Clogheen. She will stay there for as long as it takes her to heal. Tommie will be able to drive himself to visit her every day. After an entire month of depending upon others, he is nearly overcome with relief. We see the people every Saturday when we go for breakfast in Cahir. We have gotten to know them in a particular kind of a way. We always sit in the upstairs and so do they. They come in and have coffee and breakfast and they do a crossword puzzle. The woman told us that it is the same one that used to be in a newspaper to buy but now they can get it for free in the Farmer’s Weekly. They bring a duplicate copy and they each start the puzzle at the same time. It is a Saturday morning competition. She said that he usually wins but she says she is better on certain kinds of clues. Over the months we have learned where they live and we know that she is not local but comes from Carlow. And we know some others things about them. And they know things about us. We always chat and say morning things to one another. We do not know their names. Between ourselves we call them The Crosswords. We do not know how they speak of us. I am not sure that they know that we always have porridge. This morning Simon went into the men’s toilets. He saw the Crossword Man standing by the sink speaking to someone on his mobile phone about one of the clues. The man winked at Simon and put his finger to his lips. Every week we learn more about The Crosswords. The secret of the Crossword Cheat has taken things to a whole new level. There is a regular robin at the outdoor table. Actually there are several regular robins. None of the robins are Michael. I know I shall never see my Michael again but I enjoy imagining that I might. I am surprised at how different each robin looks from every other robin. I do wonder and ask the robins if one of them might be a brother or sister or aunt of Michael. I do not expect an answer but I ask anyway. I keep the feeders full and some crumbs out on the table. There are so many Michaels. It is one of those names which is used again and again and again. Not for robins but for people. I wonder why I even chose the name Michael for my robin when there are already so many Michaels. I could easily write a story with every single person in it named Michael. Every person would be a different Michael but they would all be Michael. I saw one Michael this morning who said he was pleased that the day was starting dry. He said, “We have enough rain got.” I have been thinking about his phrasing all day. Marian was telling me about a woman. She felt certain that I must know her too. She could not remember the woman’s name so she did a fair job describing her, even telling me the road where the woman lived. She said,“You would know her by sight sure you would.” She said, “You can’t miss her. She looks like an Uncooked Pastry.” Now each time I go to the village I am looking for this woman. There cannot be more than one who fits this description. There were 12 square red buckets spread about in the field. It seemed a lot of buckets for not very many sheep. 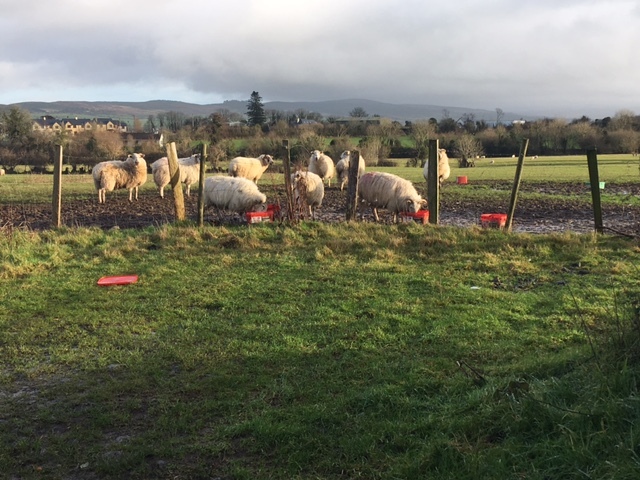 The sheep wandered back and forth eating out of different buckets but I am sure that whatever was in the red buckets was all the same kind of food. There was one green bucket. That was probably the same too. Donal sent me his CD. It is called Dead Air. It was a strange time for it to arrive. Our ancient CD player continues to act up and the one in the car does too. The car engine itself is also acting up. I hear an unsettling droning sound when I drive uphill. Mike, my regular mechanic, is in the hospital. I spoke to him on the phone but he will not be out and working again for a long while. I went down to Noel O’Keeffe in the village. His mechanic Noel Hackett and I drove up into the mountains. We both listened to the droning sound of the car as we climbed. I had not seen this Noel for a long time so we chatted about a lot of things as we drove along. He told me about his family. We noted new houses along the way and he told me who was living in them or who planned to live in them once there was enough money to finish building. I had not been up that particular road in a year or more. I was distracted thinking about the number of new houses while all the time Noel continued paying attention to the droning. He had me listen to understand that the car made the same noise going downhill as it had been making going uphill. That helped him to recognize the problem. In between the strange moaning of the car and the distortions of the CD players, I eventually listened to Dead Air on my lap top. I cannot really say what I think of it except that everything kind of fits together. Simon is still discussing his tooth gluing repair. He is delighted with it and with his new ability to bite things. He has already located another tooth which he thinks might be a candidate to be attached to the one beside it. He discusses the repair job with anyone who shows the slightest interest. He is happy to add the fact that in addition to the cementing job, Daniel also gave him a full cleaning of his teeth. And then he was only charged fifty euro for everything. While speaking about his repair work, he never mentions that Daniel uses old souvenir tea towels around the neck of his patients. He has been going there long enough that he now considers a tea towel bib as normal dental practice. 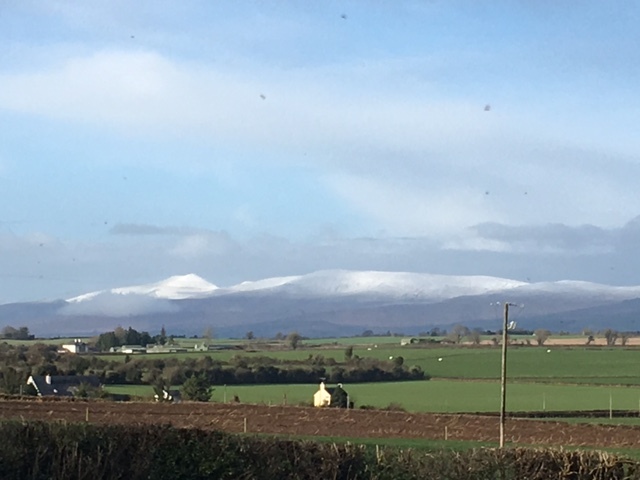 Snow on the Galtees. Green fields. Sunshine. Cold but dry. Billy had heard about the new flights flying from Cork to the USA. The flights are cheap. The price of the flights are almost half of what they usually are. He liked the idea of maybe going on such a flight but he was nervous. He had been told that a lot of people on the plane take their own lunch because the airline charges so much for food. He likes the idea of the cheap flight but he is disturbed about the idea of taking his own lunch. He said he would not want to be the only one. He worried because he would not want people to think that he was Skint. He said if he knew that everyone else was doing it, it would be alright then.